According to the Russian leader, Russia has to "react to what’s going on around us"
NEW YORK, July 17. /TASS/. Russia’s reaction to NATO’s decision to grant membership to Ukraine and Georgia would be "extremely negative," Russian President Vladimir Putin said in a Fox News interview on Monday. "For us, well, it's a direct and immediate threat for our national security…moving this NATO infrastructure towards our borders would be a threat, and the reaction would be extremely negative," Putin said. "It is a concern for us since the NATO is expanding its infrastructure and facilities, the number of servicemen is on the rise in the regions where they shouldn’t be," Putin said, adding that the military contingent in those regions has been increased by 10,000 people. "This is incompliant to the treaties between Russia and NATO. And this is a destabilizing factor, which we have to factor in, but we haven’t mention this today with President Trump." 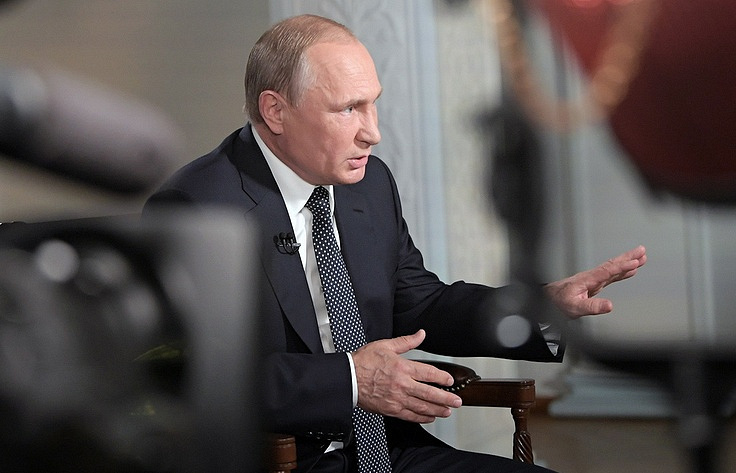 According to the Russian leader, Russia has to "react to what’s going on around us." "Take the NATO expansion to the east. When the Soviet Union was withdrawing troops from Germany, we were told that Russians should know one thing: that NATO would never extend [eastward] beyond the German borders. Within two waves, it happened, despite our principal posture. Nobody gave a damn about our posture," he said. During the NATO summit in Bucharest ten years ago, NATO leaders vowed that Ukraine and Georgial would eventually be granted membership in the alliance.